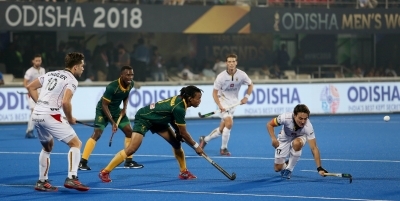 Bhubaneswar, Dec 8 (IANS) Belgium thrashed South Africa 4-1 in their last Pool C match of the men's hockey World Cup here on SUnday. The European giants dominated right from the start and simply blew away their opponents with a four-goal blitz in the first two quarters. Ironically, it were the South Africans who had enjoyed the more promising start as Nick Spooner scored a field goal within the opening minutes to raise visions of an upset. But Belgium fought back and restored parity through a penalty corner conversion by Alexendar Hendricks in the 12th minute. The Belgians took the lead six minutes later when Arthur Van Doren and LoÃ¯ck Luypaert created an excellent move from their own half before a long ball found Simon Gougnard who beat South African goalkeeper Rassie Pieterse with a calm finish. Hendricks completed his brace off another penalty corner in the 21st minute as the Europeans tightened their grip on the match. Luypaert scored Belgium's fourth goal a few seconds before half-time as the title contenders from Europe went into the break with a formidable advantage.